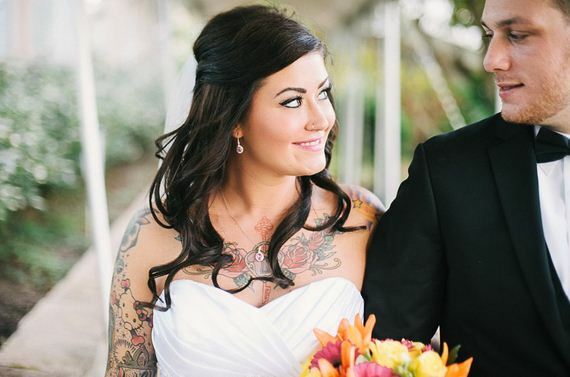 The most popular question among tattooed brides is to show or not to show their tattoos on their wedding day. 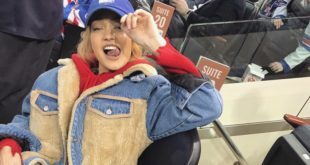 A lot of women choose to cover them up but it’s not a good idea. 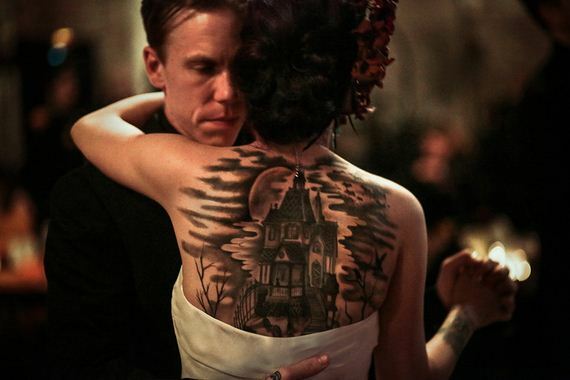 You shouldn’t be afraid to show your tattoos on your wedding day. 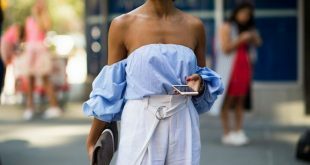 But instead you need to find a dress that will perfectly fit and complement your body art. 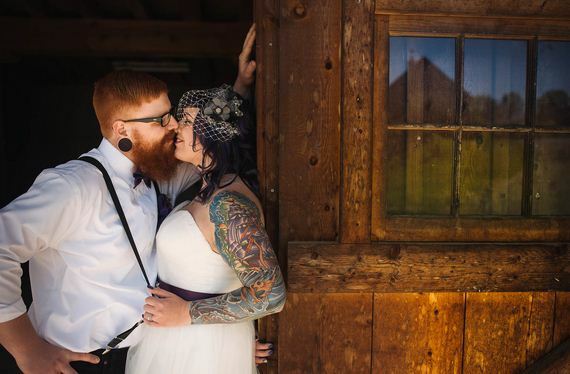 And, of course, there are a lot of wedding themes for tattooed couples and we’re going to show you the best wedding ideas for tattooed brides. 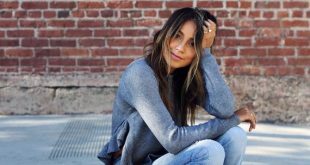 Hope this post will inspire you! 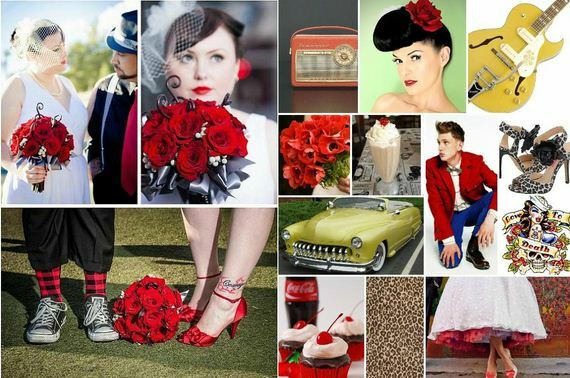 It’s a perfect idea for couples who like a retro theme. Curly hairstyles, bright lips, Elvis’ rock-n-roll songs, big bouncing “poodle” skirts, old cars – especially the 1950 Mercury convertible – all these details can be used for this kind of a wedding. 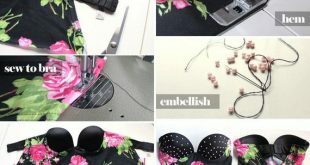 Use pin-up cards for the tables and pin-up posters. Don’t forget about pop-corn, coca-cola, soda and American cuisine – hot dogs, hamburgers, milk shakes and fries! Your guests will feel a real atmosphere of the 1950′s. A big advantage of this theme is that you can choose really colorful and bright shoes to complement the wedding dress. It’s a must for that pin-up look. Thanks to this your tattoos will look great! 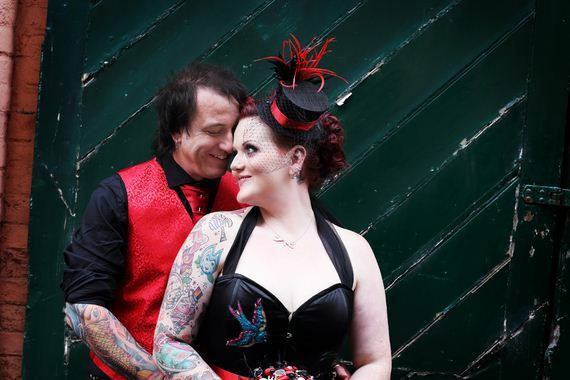 Remember that time when you were a kid and had a make believe wedding with the slightly unwilling boy that lived next door – it was your childhood dream wanting to be married at the circus! Such a wedding will bring back those childhood memories and will only be loads full of fun. 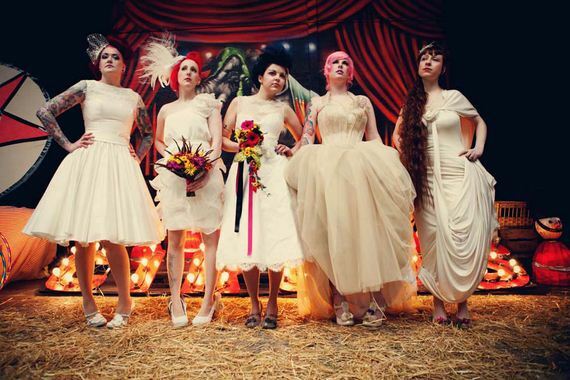 You can rent a big bright tent for your ceremony, a retro car and even hire a magician and acrobats! It’ll be interesting for kids and adults as well. Your guests won’t be bored. 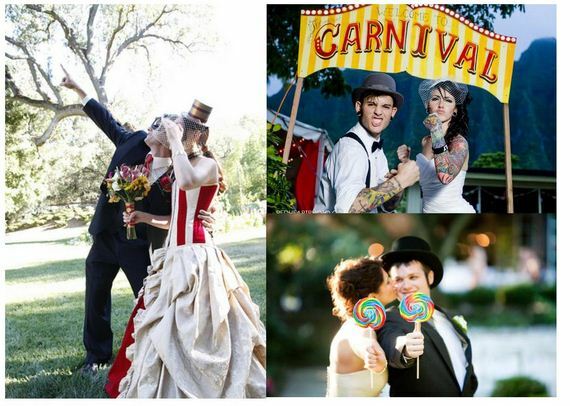 Choose a red color as the main color for your wedding, it’s bright and will be perfect for a circus wedding theme. Waiters can wear funny wigs and red noses (or real clown suits!). The “Castle Carrousel” can be ideal for your wedding photo shoot. Of course, you need to have a sense of humor for this kind of wedding. But it’s a popular theme among tattooed couples. 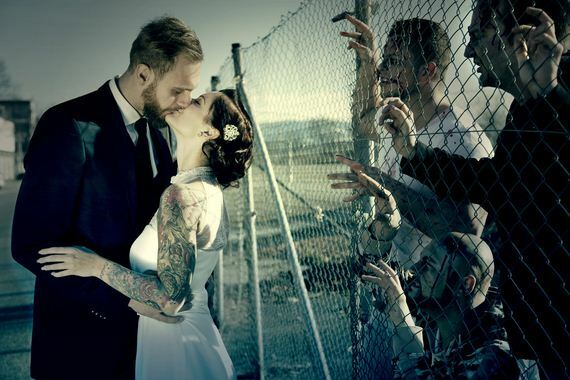 Tattooed brides look great in zombie style. You don’t need to wear a pricy luxury wedding dress, even Converse shoes will look great and everyone will smile. 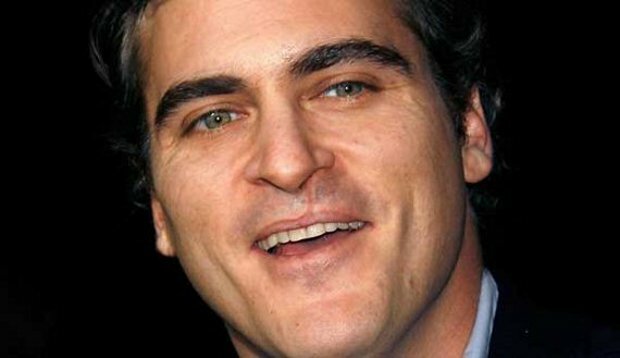 The most important detail here is to hire a professional make-up artist. We don’t need ‘stupid’ looking zombie make-up. It needs to be a perfect look, done by a pro. And you need to be sure that your guests and parents will understand this kind of wedding. Be creative with your wedding bouquet – choose black roses or take white flowers with ‘blood’. It’s a good chance to make a wedding on a budget, because you don’t need to rent a luxury place. A forest or some abandoned buildings will be ok! 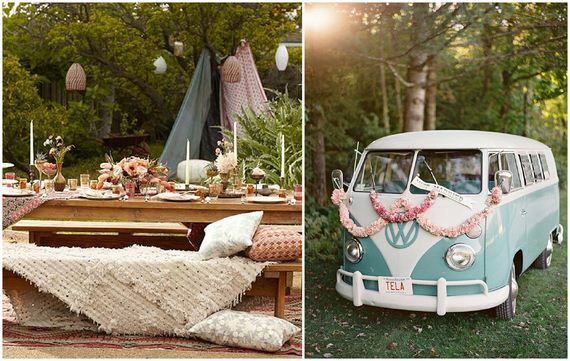 A wedding in the hippie style is bright, positive, free from stereotypes and limitations, full of love, peace and harmony. 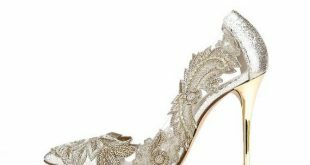 A bride should wear a light dress and convenient shoes, or just go barefoot. You can add bright beads, baubles and ribbons. The most important advantage of such a wedding is the price. It’s easy to make it on a budget. You just need simple decorations, and a place for the ceremony in a forest or a field, on a rocky overlook above the ocean, on the beach – you get the idea – a natural spot. And don’t forget about a ‘hippie’ car for your photos! A 1960 VW Micro Bus is perfect. 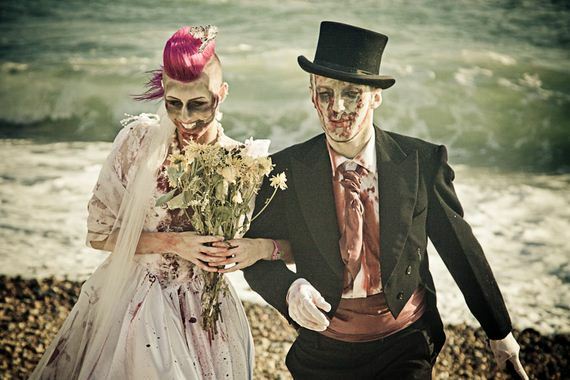 A cool touch is to have those in your wedding party wearing Greatful Dead T-shirt and jeans! You don’t want to go too far with this idea. Just black or red details on the dress or a black or dark dress. If you want a white dress, you can have a black bouquet and of course, you need dark make up. Spiders, spider’s web and other Halloween details will be perfect for this wedding. And a tattooed bride will look like a natural for this kind of wedding. 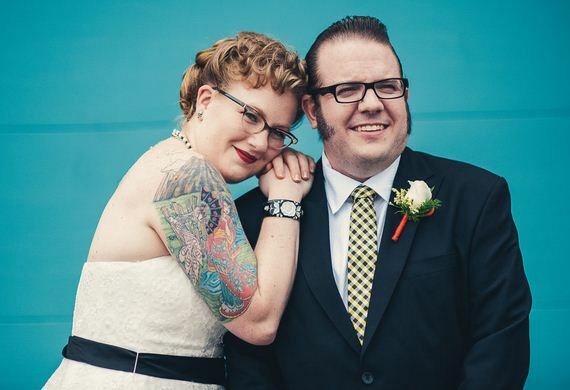 If you still have some doubts, you have to see these photos of tattooed brides. 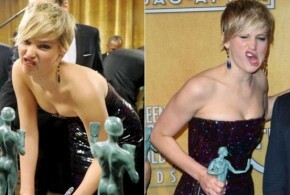 Everyone will agree that they look just gorgeous. Today getting a tattoo is the norm not the exemption and is welcomed by the modern youth. 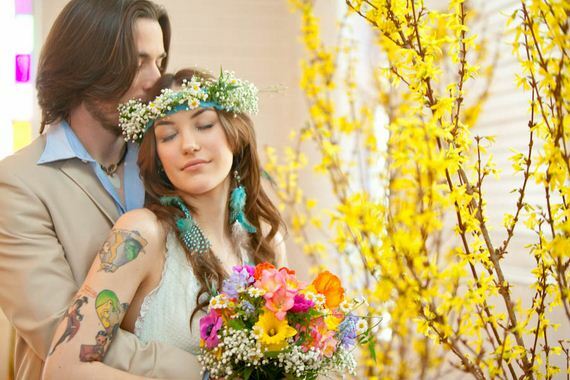 Don’t have doubts – tattooed brides are definitely on-trend today!